Yes, that is me, back when I could be called "cute". 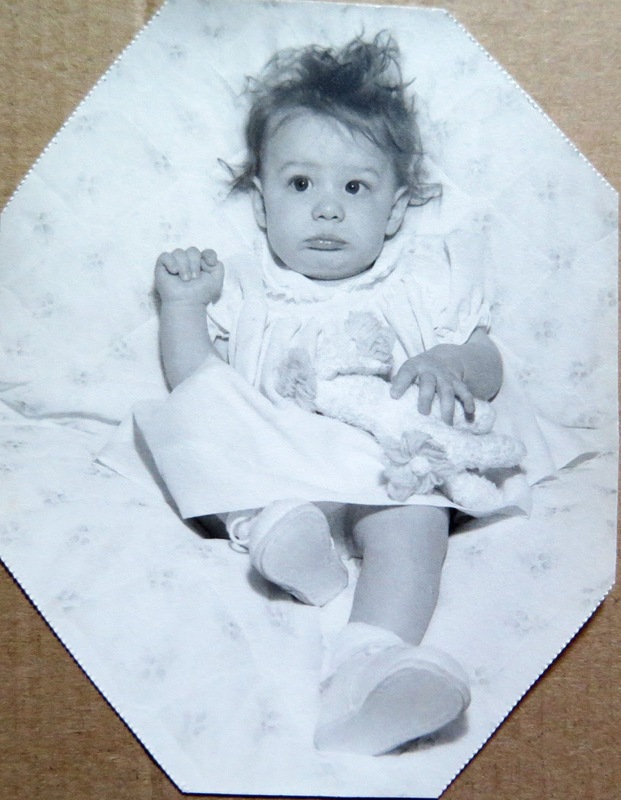 Even at that tender age, you can tell that I was doing my own thing when it came to my hair. 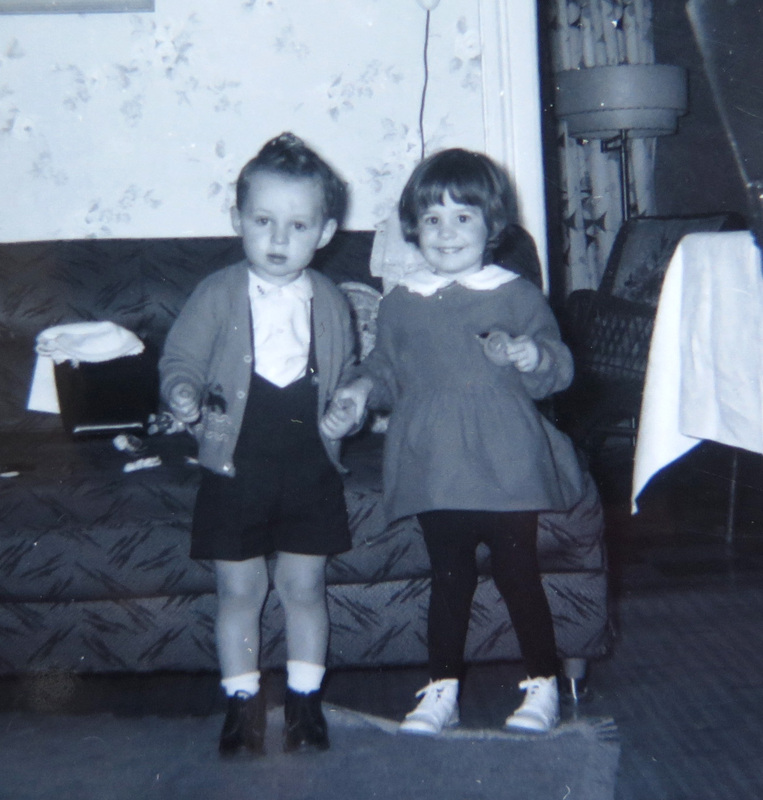 Again, still cute at age three, and one of my favourite photos from my childhood. I'm clutching the arm of my cousin Jeff, who was a year younger than I, and who, along with his two younger brothers, would become my playmates during the summers. I suppose you could describe my hairstyle as a "bob". Saggy crotch leotards would become the bane of my childhood existence. Throughout public and secondary school, my hair went through whatever style was deemed workable for fine, straight hair, even the ghastly all-over perm. 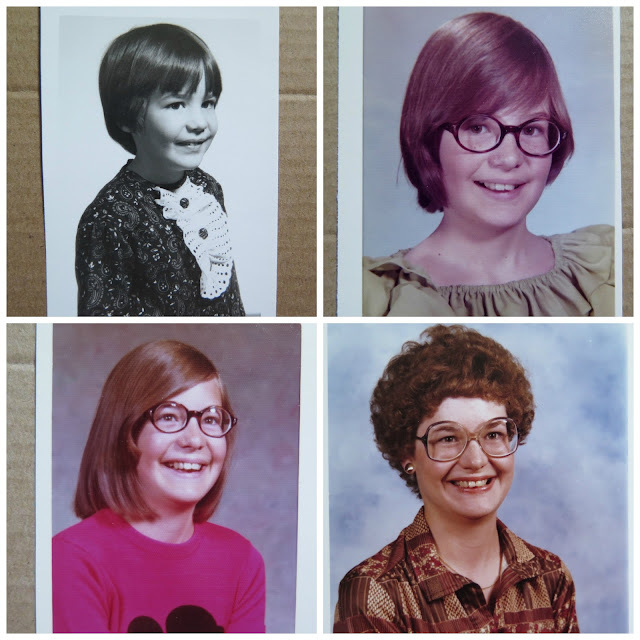 While I was growing up, long hair was the norm for girls, while mine was mostly short, except for around Grade 5 (bottom left), when it reached shoulder-length. I think my mother most likely did not have the time to spend on the maintenance that long hair required, and by the time I was old enough to make my own hair style decisions, I don't remember having any strong desire to grow it out. 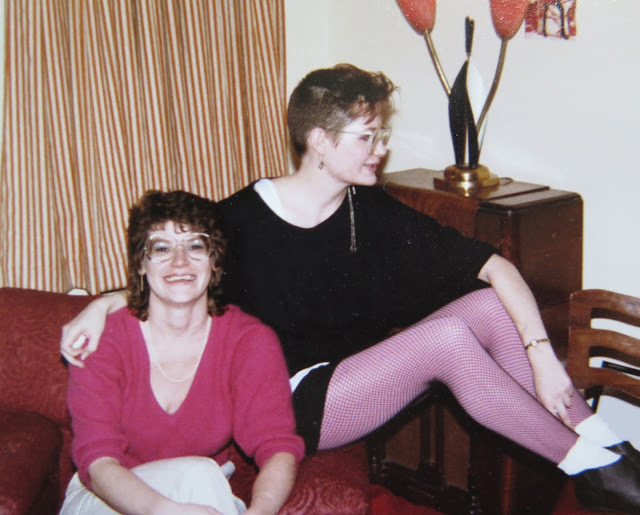 Then I graduated high school and I moved away from home to go to university in London, Ontario, and for some now-forgotten reason, I decided to not only grow my hair, but also get it permed. This is the only photograph I have documenting that brief experiment, from around 1982. 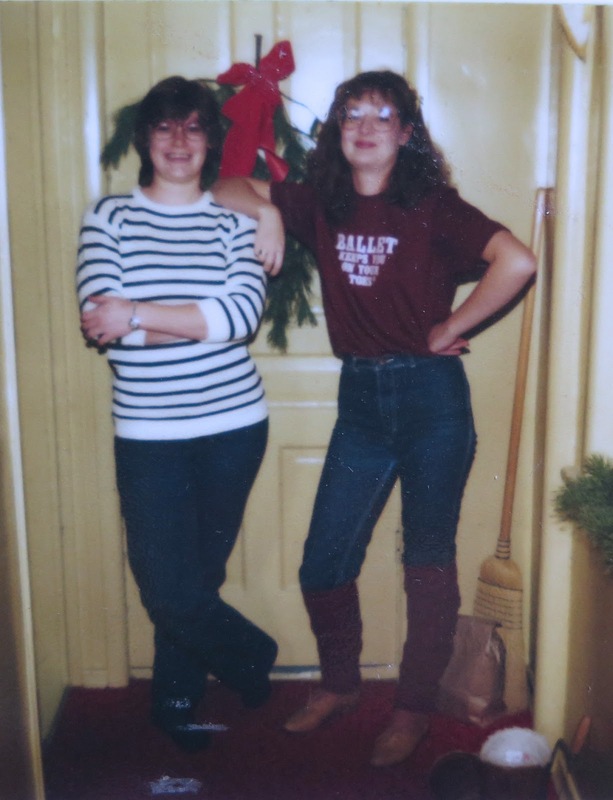 I was taking dance classes at university and if my technique and flexibility were not impressive, I was at least determined to look the part - note the Ballet-themed t-shirt, leg warmers, and jazz oxfords (I'm surprised I'm not wearing an off-the-shoulder flashdance sweatshirt). That's my friend Joanne on the left. What a difference three years make! Joanne came to visit me in London around 1985 after I graduated university and got my first apartment on my own. I was working in a record store, and had embraced my inner punk (I was especially happy with my black fishnets over pink tights look). 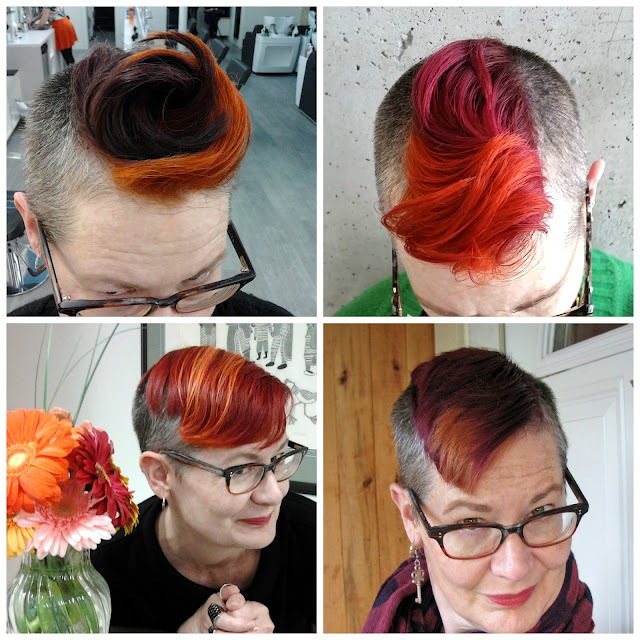 From that point on, aside from a short-lived Louise Brooks style bob in my early 30's, my hair stayed very short, and the experimentation with colour began. I soon discovered that having close-cropped hair meant put me on the receiving end of comments like "what are you, a dyke? ", or the unimaginative "Freak!" It could be pretty upsetting at times, but oddly enough, it didn't make me grow my hair. More than one boyfriend wistfully askd me if I would let me hair grow, and some guys felt it necessary to point out that "I would be prettier with long hair". I bleached it blonde in 2008, and when I finally realized that was not the most flattering colour choice for me, I added hot pink. For the last few years, I've had the "shaved back and sides, long on top" style, and it feels very much like "me". I stopped colouring it all over about 3 years ago and the "natural" sides and back let me get used to the incoming grey, but still gives me a long piece on top to play with, and as you can see from the photos, I've tried a few different colour combinations. It's interesting to note that I don't get called a "freak" anymore because of my hair - most people's reactions are very positive - but the assumption is still made that I'm a lesbian because of my hair cut. When I moved into my current apartment 3 years ago, a neighbour informed me (after we got to know each other) that he has assumed I was gay before he met me because I had a "lesbian hair cut". And I didn't know such a thing existed! 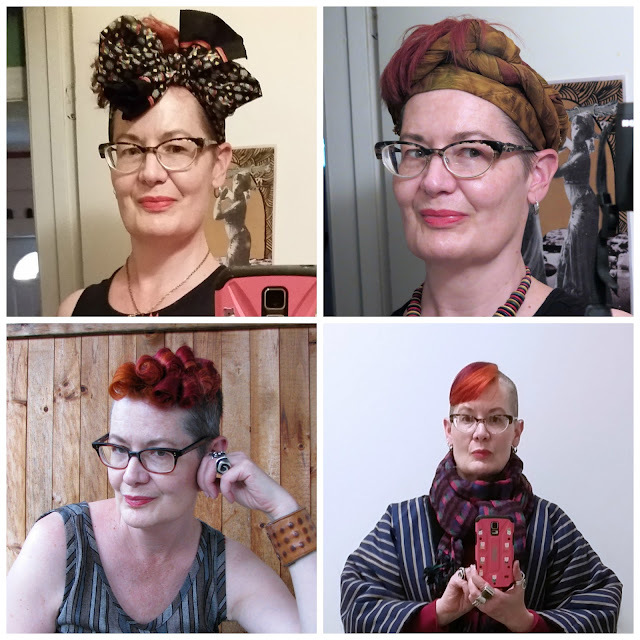 I was surprised at how versatile a small chunk of hair can be - I can wear it down and straight, up in a swoop, curl it, and experiment with scarves and other headwear. My favourite? The Big Swoop - it takes a bunch of hair product, some time with the blow-dryer and a near-toxic amount of hairspray, but the end result feels like I am wearing a piece of sculpture on my head. Have you had a hair evolution, or have you remained true to a specific style/colour for most of your adult life? Oh my gosh, some of those hairdos take me back! I think I've had a very similar hair evolution to yours, and of course, my haircut is now very similar to your existing one. I'll have to do a retrospective some time! I loved seeing your old pictures! I too had the dreaded perm that my Mom used to give me and my sister growing up. They were awful! Your hair really defines you. Great post. Hahaha, oh yes, the perm, been there, done that. I had the biggest head in school (hairwise, heh). I never grew my hair really long; I got too impatient. And my hair was fine, as in weak and limp. I always wanted a "shag" but nobody approved because of my awful weak fine hair. I love your look now. What is it with the lesbian/hair style thing?!! My mum turned up to pick me up from school with a perm, in about 1985. I walked right past her without recognising her at all, and spent what I remember as a pretty long time dashing all over the school trying to find her, before returning to my classroom in tears to tell my teacher that my mum had not come to pick me up. By then, she was in my classroom. I always hated the perm! I loved my spiral perms, I'm still dithering about having another one now! What a great hair history and some smashing photos. Love this, Shelley - the photos are marvelous (I think we're very close in age) and your hair is the total bomb. It's so you (lesbian hair? what is "straight" hair??). Like Vix, mine was cut very short and boyish when I was a kid, not a great look for me. I always think you are beautiful. Your hair evolution is a great way to share the story of your life. Love the photos and your writing, as always. Your current style is unique, colorful, versatile and very flattering. It allows for your creativity and the addition of scarves is stunning. Perfection! How cool to see you through the ages! I love your hair, and it's right in style now - of course you were ahead of your time - except most younger people pull the top back in a ponytail. I was thinking about doing that style, too, because it's about the only unique style I can do with my hair. I'll take sassy over cute any day. I got the "pixie cut" after I wrapped chewing gum around my head (long story), 80's perm..check, did anyone look good in those? What the heck is lesbian hair? As another short haired lady, I've also received some comments about my "lesbian hairstyle" (and never understand wtf they were talking about), and I'm also very happy letting my hair going grey on the sides but staying redhaired on top!. And yes, I also did that 80's perm style and big glasses, sigh! Actually, love how you play with your hairstyle, love your turbans and scarves, and love your fabulous Big Swoop!! funky and fabulous!! 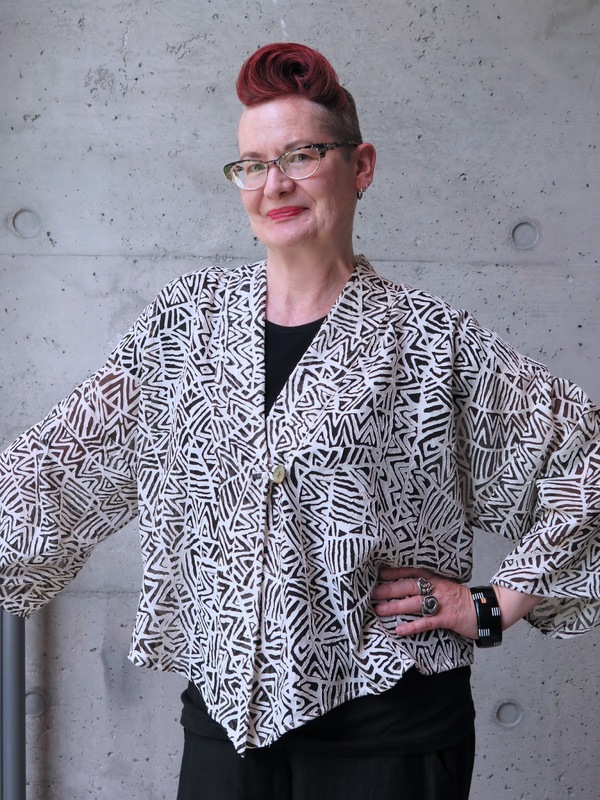 I love your hair as "wearable fine art", Shelley! I don't use product or colour myself but celebrate those who do. My hair is thick, fine and slippery. No curl has ever stayed in it for long. Nor pins, combs, or elastics either! I've had short hair most of my life except for a few years with it very long in the late '60's/early 70's. Too much work with long hair so I wore it very close-cropped for years and always got hit on by women! Flattering if unsolicited. Heh. Now my hair is back to almost the same style I wore in my early teens - not quite so short and layered with bangs. The natural colour is kinda different though with the gray streaks! I love it when you talk about your hair! My mama was a bright redhead who started going grey her sophomore year in high school, the year she went into the bathroom and dyed her hair platinum blonde without telling her own auburn-haired mama (late 1950's). I'd heard this story my entire life, and so when my sophomore year of high school came, I took it as permission to do the same and dyed my waist-length natural platinum blonde hair an auburn color with a "rinse out" concoction (we always want what we don't have!). 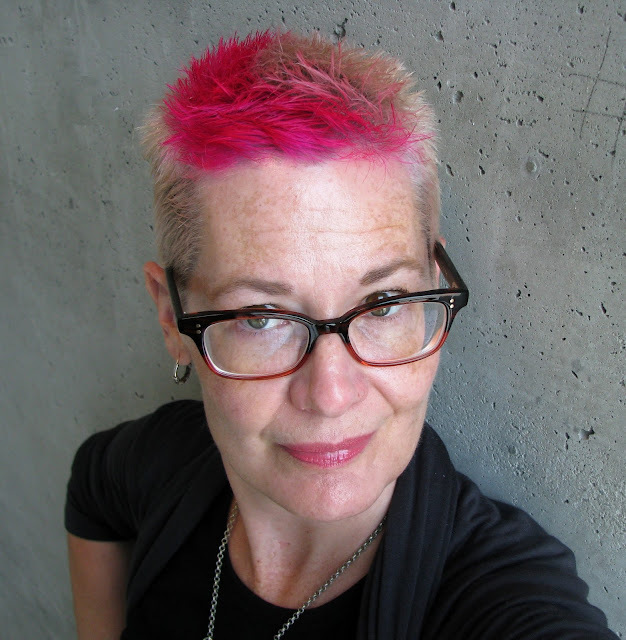 Unfortunately, being naturally almost white haired and having never subjected my hair to any chemicals prior to that, the auburn rinsed out to a bright shade of pink that was decidedly uncool back in 1990 in my small rural town on the central coast of California (but would be quite cool today I'm sure). I didn't care though, I fell so hard in love with the way I could change everything about me with a change of hair color. I too got called a dyke, but it was for wearing birkenstocks in the same small rural town. :) Now I'm 40 years old, and I live in Shanghai, China, the land of dark hair. My hair is a super bright copper orange only found in a bottle. As a curvy Caucasian woman in China, I'm going to stand out. At least with my bright hair, I stand out on my terms. I think I've been rocking the same color all four years I've lived here, kind of a record in my constant chameleon hair color changing. My natural hair color has gone from blonde to a quite bright white after a hysterectomy two years ago, which makes an excellent canvas for the bright orange color. My hair grows very, very fast, so I tend to only get a single haircut each year, generally chopping off about 9-10 inches each March. The few times I've had a truly short haircut I could not afford to maintain the cut due to the fast growth, so this works instead. Thanks again for sharing your hairstory! 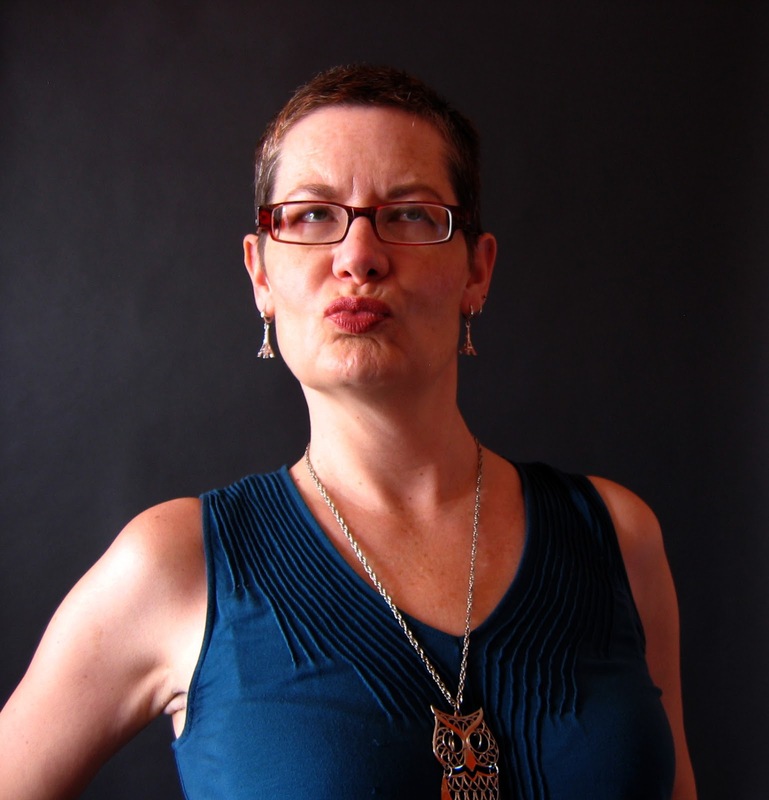 Heather, thanks so much for sharing your own Hair-History. I'm sure a lot of women would have killed to have your waist-length platinum blonde hair, but as you said, we all want what we don't have. What fun, Shelley. It brings back all of our hair evolution memories. Perhaps you'll start a trend in a bloggerhood and we'll get to see everyone's hair-story. What a treat. Anyway it's true, you've come a long way baby and the do you have now is so do-able as you've shown us. Well done, well done. Love seeing all these photos, Shelley - I think our hairstyles really tell as much of a story about our lives as our wardrobes do. And your current swirling creation is awesome! Fantastic post. So much recognition. Even though you were over there and I was in The Netherlands, I did a lot of the same things. Just not short hair haha (that is half the post Greetje). I think indeed your hair is now like a sculpture. You can set yourself apart and we all want to be unique. Well done. You are basically a good looking version of me! But I haven't done the colour yet...too lazy. One of the best parts of aging, learning what you like. BTW lesbians in my acquaintance have deliberately shaved parts of their hair to signal their lesbianness (?) to other lesbians. So maybe that's what your neighbour meant.